BRANDON, Man. 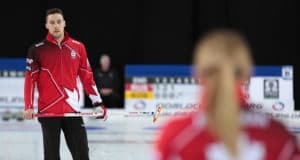 – Kevin Koe and Brad Gushue don’t miss many given opportunities and they did it again Sunday afternoon to win their second straight games at the Tim Hortons Brier, presented by AGI. Gushue, and Team Canada (2-0, St. John’s) of third Mark Nichols, second Brett Gallant, lead Geoff Walker, alternate Tom Sallows and coach Jules Owchar, had a battle on their hands until they cracked a three-ender in eight to beat Jamie Koe of Team Northwest Territories (0-2, Yellowknife.). Koe, third David Aho, second Matt Ng, lead Cole Parsons and alternate Shadrach McLeod gave up two to Gushue in the first end but fought back and were tied 4-4 in the seventh. Three-time Tim Hortons Brier champion Kevin Koe and Team Alberta (2-0, Calgary) of third B.J. Neufeld, second Colton Flasch, lead Ben Hebert, alternate Ted Appelman and coach John Dunn, jumped on chances to score deuces in the second and third ends to set up their 8-5 win over Scott McDonald of Team Ontario (0-2, Kingston). It was a difficult opening two games for the rookie McDonald team, having played Team Canada on Saturday, losing 7-6. After giving up two to Koe in the second, McDonald came up short with a last-rock draw in three to let the Alberta team steal 2-0. 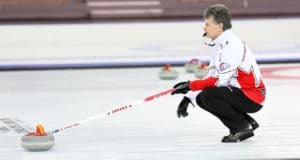 Jim Cotter and Team British Columbia (2-0, Vernon) scored four in the fourth end and three in the eighth to beat David St. Louis and Team Nunavut (0-2, Iqaluit) 10-4. Stuart Thompson and Team Nova Scotia (1-1, Dartmouth) stole singles in the seventh, eighth and ninth ends to beat Terry Odishaw and Team New Brunswick (1-1, Moncton) 7-3. The 2019 Tim Hortons Brier continues with tonight’s draw at 7 p.m. CST. TSN and RDS2 (streamed on ESPN3 in the United States) will provide complete coverage of the 2019 Tim Hortons Brier. CLICK HERE for the complete schedule. 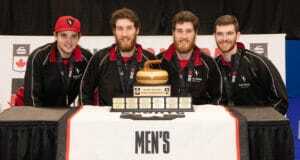 For ticket information for the 2019 Tim Hortons Brier, go to www.curling.ca/2019brier/tickets.